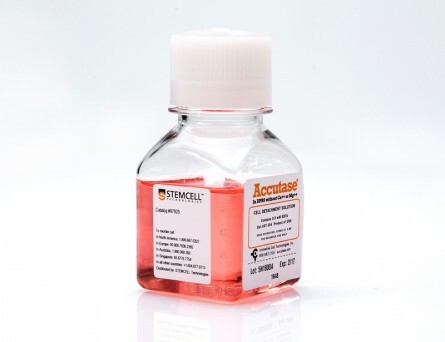 CloneR™ is a defined, serum-free supplement designed to increase the cloning efficiency and single-cell survival of human embryonic stem cells (ES cells) and induced pluripotent stem cells (iPS cells). 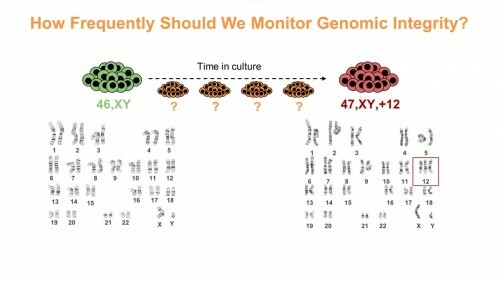 CloneR™ enables the robust generation of clonal cell lines without single-cell adaptation, thus minimizing the risk of acquiring genetic abnormalities. 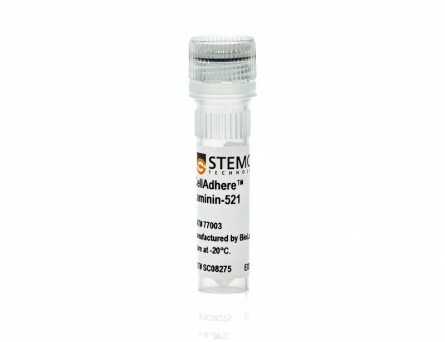 CloneR™ is compatible with the TeSR™ family of media for human ES and iPS cell maintenance as well as your choice of cell culture matrix. 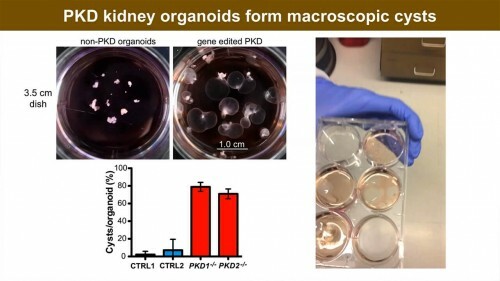 On day 0, human pluripotent stem cells (hPSCs) are seeded as single cells at clonal density (e.g. 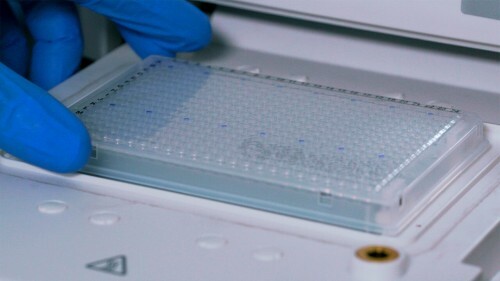 25 cells/cm2) or sorted at 1 cell per well in 96-well plates in TeSR™ (mTeSR™1 or TeSR™-E8™) medium supplemented with CloneR™. On day 2, the cells are fed with TeSR™ medium containing CloneR™ supplement. 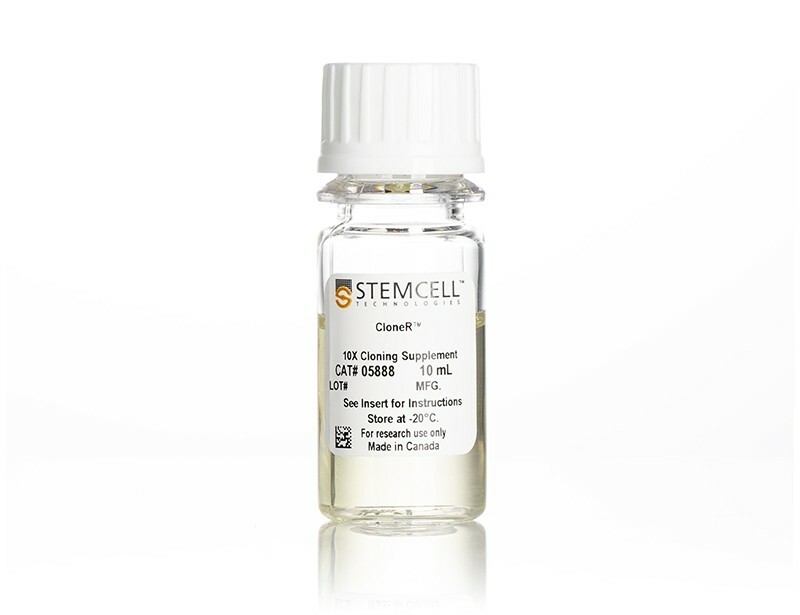 From day 4, cells are maintained in TeSR™ medium without CloneR™. Colonies are ready to be picked between days 10 - 14. 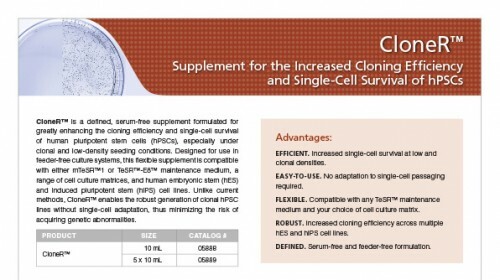 Clonal cell lines can be maintained long-term in TeSR™ medium. 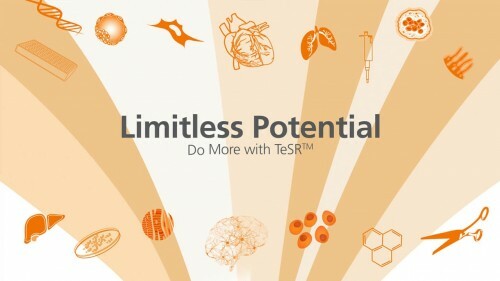 TeSR™ medium supplemented with CloneR™ increases hPSC cloning efficiency compared with cells plated in TeSR™ containing ROCK inhibitor. 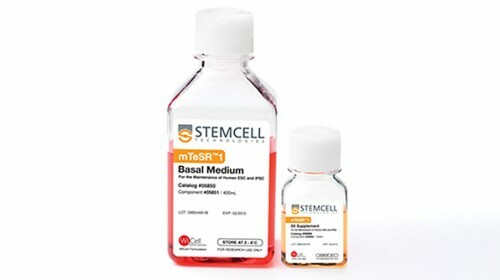 Cells were seeded (A) at clonal density (25 cells/cm2) in mTeSR™1 and TeSR™-E8™ and (B) by single-cell deposition using FACS (seeded at 1 cell/well) in mTeSR™1. 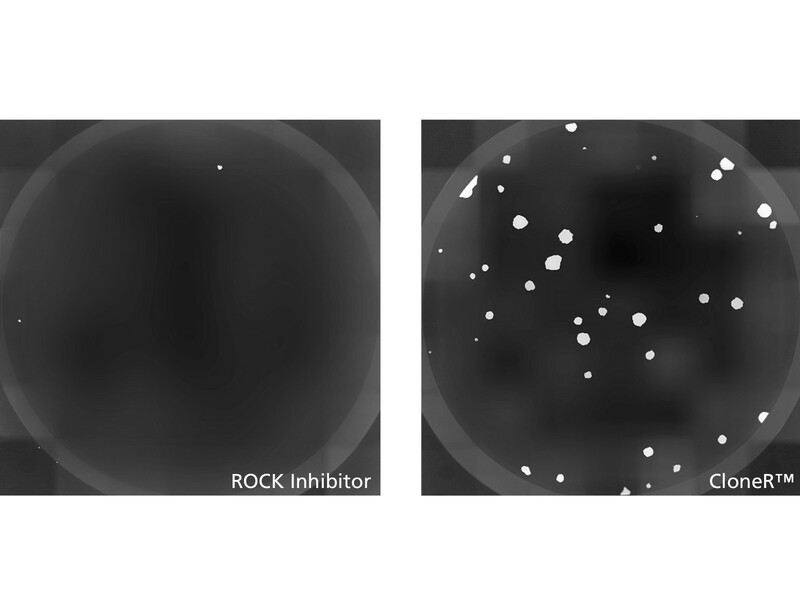 hPSCs plated in mTeSR™1 supplemented with CloneR™ demonstrated significantly increased cloning efficiencies compared to cells plated in mTeSR™1 containing ROCK inhibitor (10μM Y-27632). Shown are representative images of alkaline phosphatase-stained colonies at day 7 in individual wells of a 12-well plate. 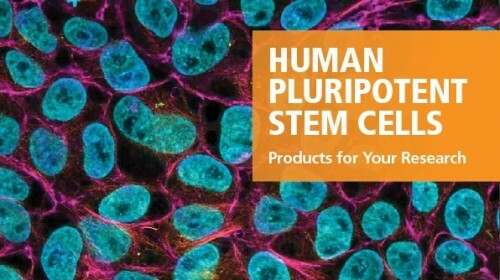 H1 human embryonic stem (hES) cells were seeded at clonal density (100 cells/well, 25 cells/cm2) in mTeSR™1 supplemented with (A) ROCK inhibitor or (B) CloneR™ on Vitronectin XF™ cell culture matrix. hPSCs seeded in mTeSR™1 supplemented with CloneR™ result in larger colonies than cells seeded in mTeSR™1 containing ROCK inhibitor (10μM Y-27632). 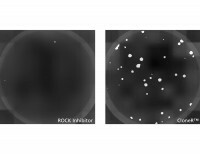 Shown are representative images of hPSC clones established after 7 days of culture in mTeSR™1 supplemented with (A) ROCK inhibitor or (B) CloneR™. 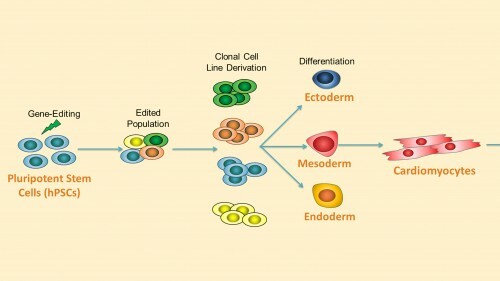 Clonal cell lines established using mTeSR™1 or TeSR™-E8™ medium supplemented with CloneR™ retain the prominent nucleoli and high nuclear-to-cytoplasmic ratio characteristic of hPSCs. 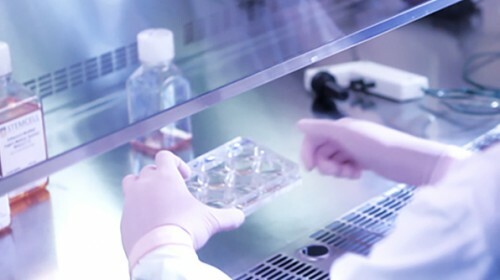 Representative images at passage 7 after cloning are shown for clones derived from the parental (A) H1 hES cell and (B) WLS-1C human induced pluripotent stem (iPS) cell lines. 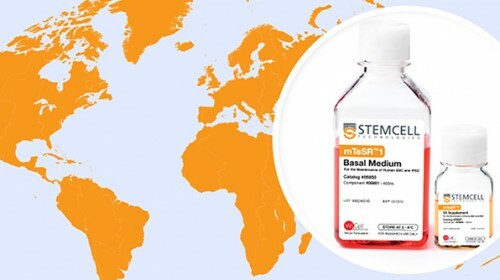 hPSC clonal cell lines established using mTeSR™1 supplemented with CloneR™ express comparable levels of undifferentiated cell markers, OCT4 (Catalog #60093) and TRA-1-60 (Catalog #60064), as the parental cell lines. (A) Clonal cell lines established from parental H1 hES cell line. (B) Clonal cell lines established from parental WLS-1C hiPS cell line. Data is presented between passages 5 - 7 after cloning and is shown as mean ± SEM; n = 2. Representative karyograms of clones derived from parental (A) H1 hES cell and (B) WLS-1C hiPS cell lines demonstrate that the clonal lines established with CloneR™ have a normal karyotype. Cells were karyotyped 5 passages after cloning, with an overall passage number of 45 and 39, respectively. 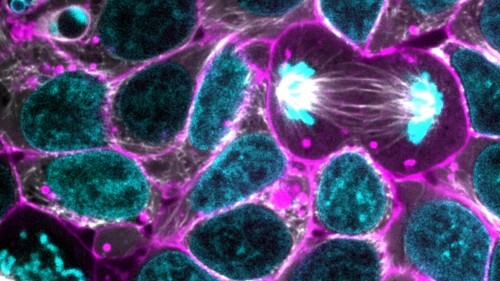 Fold expansion of clonal cell lines display similar growth rates to parental cell lines. Shown are clones (red) and parental cell lines (gray) for (A) H1 hES cell and (B) WLS-1C hiPS cell lines.